Once again the world will stand still this Saturday as it did two plus years ago when Floyd Mayweather dissected Manny Pacquiao in what was billed as the fight of the century. However, beauty is in the eye of the beholder and the majority of causal spectators felt robbed of a competitive event. Will the common sports fan tuning in August 26th be left with a bad taste feeling burnt enough to turn their back on boxing for good? Yes the world is watching and the talk hit a fever pitch a while back but will all that hype be enough for 5 million homes to plunk down the 100 dollars for a matchup most boxing media members see as a farce? 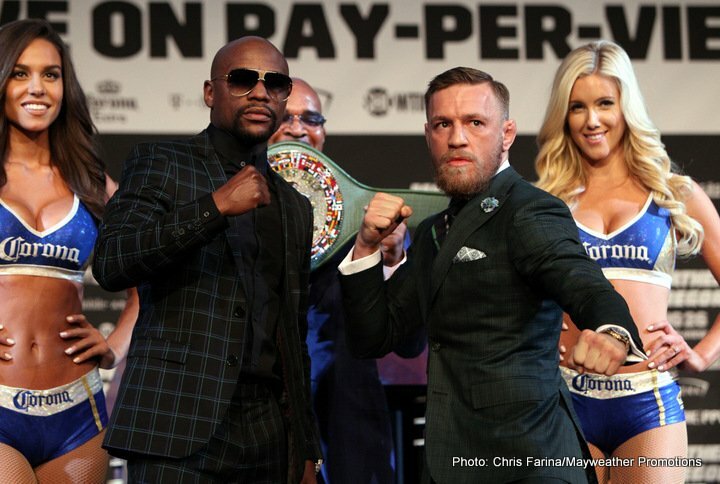 That question is the only thing standing in the way of yet another record-breaking PPV for Floyd ‘Money’ Mayweather. If McGregor has anything more than a puncher’s chance his best opportunity will come in the early frames. At minimum Conor has to put a dent in Mayweather’s defense by hurting him, obviously a knockdown would be crucial. Buzzing Floyd or scoring a knockdown could force the undefeated Grand Rapids native to come out of his shell early then planned. Or better yet for McGregor, it could keep him shelled up and worried about defending himself unable to score enough points to win the round. Shane Mosley and Zab Judah made their presents felt very early. Floyd recouped and switched up his style by pushing forward. Mayweather tactically took them a part but in a more entertaining fashion something we could see this weekend. Another layer to this matchup concentrated in the opening rounds is Floyd’s time out of the ring which is just short of two years. Mayweather will likely need to clear out the cobwebs considering it will be the longest layoff of his career. What better time to attack for Conor then the opening bell as Floyd shakes off the rust? If Floyd gets caught, it could present some counters for Conor as Mayweather opens up via aggression. If we get to the third or fourth round and Conor hasn’t cracked the code it’s basically curtains thereafter. If that’s the case the ending will depend on how Conor fights the rest of the way. If he stays aggressive he will eat too many punches and end up getting stopped. If he decides to go into survival mode by moving and/or tying up to slow the pace he could make it all 12 rounds. In the UFC, McGregor is somewhat of a patient counterpuncher who uses distance quite well. In his first fight with Nate Diaz, McGregor unleashed the beast landing a barrage of flush punches at the beginning. But Conor gassed out and faded down the stretch. In the Diaz rematch, Conor paced himself better but still slowed considerably. If it wasn’t for the kicks to Diaz’s legs McGregor probably looses again. Personally I’m in the minority in thinking Conor will have success out of gate, whether it’s the pressure or just him using awkward angles and movements that will make Floyd cautious. Once Mayweather finishes his calculation it won’t be long until it becomes one-sided. If in fact Mayweather does back up his knockout claims and actual dedicates to it, look for clean lands that open up McGregor’s face. McGregor will no doubt be clowning at times so don’t be surprised if you’re in shock from Conor’s quirky footwork or a big left hand landed in the early stages. At some point the old saying of skills pay the bills will unfold right before our eyes and Floyd will handle business per usual. My Official Prediction is Floyd Mayweather by late stoppage. Side Note: The Showtime PPV and Fox prelims feature a few intriguing fights. On Fox undefeated prospects Juan Heraldez and Jose Miguel Borrego go head and Ugas vs Dulorme is a 50-50. On the PPV portion Badou Jack challenges Nathan Cleverly and Andrew Tabiti gets a nice test from the grizzled-vet Steve Cunningham. Mayweather’s protégé Gervonta Davis is in a stay busy fight that he will handily win.